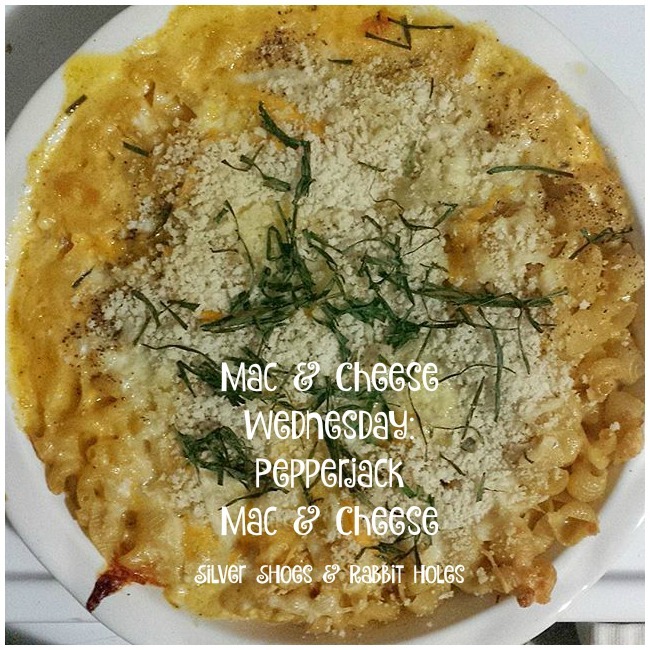 It's time for my midweek mac & cheese break! As I mentioned last week, these first three posts contain what I consider my go-to mac & cheese recipes, and this one is actually my number one most cooked recipe. I'll explain why in a moment. Instead of posting the whole recipe here, I'm going to cheat and post a link to the blog where I got it: A Beautiful Mess. There, it is called "Emma's Favorite Baked Mac & Cheese." Her recipe is cute ("This is called a roux. I have no idea how to say that out loud. I'm a reader. "), and her love of panko crumbs is to be commended. I make this a few times I month, I suppose. I usually bake it in my red pie plate, but sometimes, I'll halve the recipe and bake it in little individual-sized pots. I like that it has a lot of wiggle room in it, freeing you to use what you have on hand. I also love the addition of veggie stock (or broth). As far as spices go, I always use dry mustard, and either cayenne pepper or red pepper flakes. The rest varies, based on what I feel like using. My family almost always has pepperjack cheese in the fridge, but I usually use cheddar for the other cheese in the recipe. It's in my fridge, next to the pepperjack, and while it's oilier, the sharpness goes well with the creaminess of the jack. Sometimes, I use this recipe (which I pretty much have memorized) as a guide to make what I call "Kitchen Sink Mac & Cheese." This is when I take all the little bits of cheese we have left in the fridge - maybe some dill havarti, a little gorgonzola or feta, mozzarella, etc. - and mix them up. It's like a great experiment. It's almost always delicious. Truth: I didn't watch Punky Brewster all that often as a kid. I watched sometimes, but not every episode. The reason I showed it to the girls was Sabrina: The College Years. Soleil Moon Frye played Roxie, one of Sabrina the Teenage Witch's roommates, and I kept calling her Punky Brewster. The girls wanted to know why. After that night, every time I made this recipe, the girls wanted to watch more Punky Brewster. They think it's sweet, and the clothes are HILARIOUS. We checked out the DVDs from the library, and hunted more down on YouTube. Honestly, I make this recipe so often now, they finally stopped associating it with the show, but for a while, it was very funny. I'll leave you with the episode I always remembered best. Remember, kids: Never play in abandoned refrigerators, and always pay attention when they teach you CPR in school.